: Apizza Scholls is a perfectionist establishment at heart, but a combination of competition and experience is leading it to relax some rules. It is open for lunch on weekends; "to go” pizzas are available based on "dough availability"; a limited number of reservations are taken. There’s also a "build your own" pizza option, although guests are still restricted to a maximum of three ingredients. One other constant: the dough contains just four ingredients (flour, water, salt and yeast) and is fermented for 24 hours. 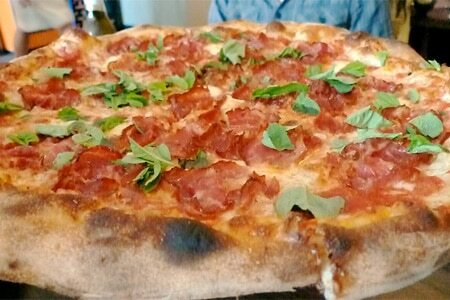 Quality fresh mozzarella, cured Italian meats, hot peppers and sauce are applied sparingly to enhance, not overwhelm, the balance between toppings and crust. Baked in a 900-degree wood-fired oven, the crust is slightly charred and chewy. Consider the understated yet flavorful sausage and peppers combo, and the rich tartufo bianco with a ricotta sauce redolent with truffles. Salads abound. Try the simple Caesar or a seasonal mixed greens with blue cheese, apples and pecans. Vegetarian or meat antipasto platters will appease your hunger until the pizza arrives. Ice cream sandwiches are the only dessert option. There is a small but carefully curated list of Oregon wines and microbrews. Pleasant backyard patio seating is a possibility in warm weather months.